Is It OK For Children To Use Teeth Whitening Toothpaste? Have you ever wondered if it’s OK to use a teeth-whitening toothpaste on your child? It is effective and useful? And most importantly, is it safe? The first thing to check when using any toothpaste on a child is the label; make sure the toothpaste is age-appropriate (most will say they can be used on children aged two and up). Consider also that children’s teeth are not permanent, and whitening can be more of a concern as their permanent teeth erupt and their orthodontics have been taken care of. 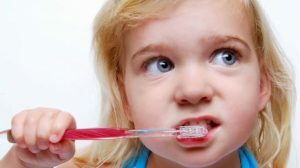 Most dentists agree that regular toothpaste with whitening ingredients are okay for children to use, but only in small (pea-sized) amounts and when they learn to brush properly, i.e. not too hard! Additionally, whitening toothpaste will only help with surface stains, not deeper stains that come from injuries, medications, or foods. Sometimes too much fluoride can also cause dental fluorosis, so check with the dentist on the right toothpaste for your child. You may also want to consider some of these tips to get your child to brush his or her teeth to keep them pearly white. Kids like superheroes, cartoons, and sparkly things in general, so if you let your child pick out a toothbrush he or she loves, perhaps it will get used a bit more! Yes, these are a thing. And very reasonably priced! When your child can activate fun tunes by brushing, who would say no to that? You may even want to get one for yourself. They do make kid-friendly versions of these, and while a pricier toothbrush may seem silly when your child is only learning to brush, electric toothbrushes are proven to keep teeth and gums healthier by applying a more appropriate amount of pressure and moving in the right direction. Even though the thought of brushing with bubble gum grosses a lot of adults out, it seems to be the flavor they pick at the ice cream store, so why not let them choose a toothpaste flavor, too? The most important thing to remember when you have any questions about your child’s oral hygiene is to schedule an appointment with us. Our pediatric dentists at Hines Little Smiles are happy to help. As some of the best pediatric dentists in Columbus, Ohio; Dr. Hines, Dr Anderson, Dr. Vollmar, and Dr. pagé work hard to keep your kids happy with a healthy white smile!